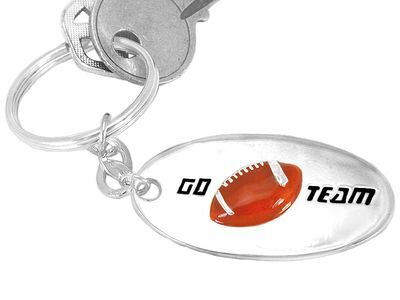 Key Chain Shows A Silver Finish Oval Printed With The Words, "Go Team" On Either Side Of A Raised Football! Key Chain Measures 4 1/4"L x 1"W.
Exclusively Ours! We Are The Only Manufacturer Of This Key Chain!